Yesterday I visited the beautiful Clifton Village in Bristol to wander the shops and pretend that I lived there.... well, a girl can dream! It is a stunning area covered in cobblestoned roads, quirky shops, delicious restaurants and fruitful markets. Here are a few (or 40...) photos I took along the way. For the past 3 months I have been working as a lifeguard at a summer camp in America. It was an insane summer that I'll never forget, but when I was thinking about doing it and starting my application, I had SO many questions. So this is going to be as much information that I can remember and advise for anyone who is thinking or is applying for summer 2017. Summer camp is a place where kids can go to enjoy a summer in the outdoors with structured activities, games and traditions. It gives you an opportunity to teach something you are good at - like football, basketball, water sports, arts and crafts, photography - in an environment that is different from anywhere else in the world, all whilst being paid. Go to USA Summer Camp and sign up. Pay the £50 deposit - the total fee is either £299 (not including flights) or £599 (including flights) that you have to pay over the course of a few days/weeks. Once you have done the above, someone at the USA Summer Camp office will call you for a quick 10 minute phone interview. It is just a few questions about you and why you want to go to camp. You will then be referred to one of their agents who will arrange to meet for a face-to-face interview when it suits you. This is an informal, laid-back interview where their agent will ask you questions that will eventually go on your completed application to help you get hired in a more attractive way. Next is the job fair where you could potentially get hired on the spot. Print off a bunch of applications and start queuing! Now you are hired, you have to apply for your visa, which costs approximately £150. Complete the paperwork, book your slot and head down to London's US Embassy. You also have to send off for your medical form (£0-£30) and your police check (£60). This is what the application process looks like. There are several categories and each one needs to be completed before you can leave for camp. This is just general facts about you to start off your profile. This is when you can leave for camp and when have to return - maybe you have work commitments or you are about to start university. This is just a general section about your skills, like if you have any qualifications like Lifeguarding, or if you can play the guitar etc. This is a document that needs to be signed and scanned by yourself agreeing to the program. I can't remember exactly what this section was, but I think it was possibly card details etc. These are similar to a CV - it is just where you went to school, your job and previous work experience. This is a very long section. It is a questionnaire made up of a lot of questions asking EVERYTHING about you. Fill it in with as much detail as you can, and use as much personal experiences possible. The questions are like "What skills could you lead at camp?" or "What are your experiences with children?". 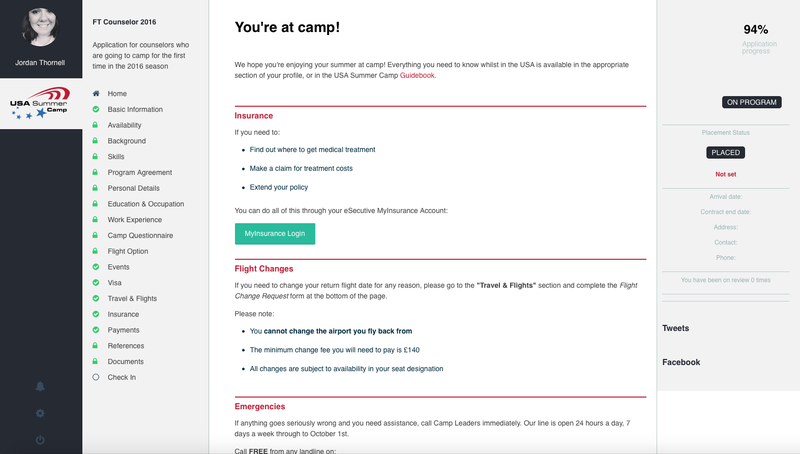 Flight option is if you want USA Summer Camp to book your flights for you or if you want to book them yourself (just a personal option). Events is a section where you have to sign up for certain events that you have to go to as part of the programme, for example, your visa application or the job fair. This section is very important and must be completed for you to go to camp. It has all of the information on how to book your visa, how to fill it in and links to all the websites you need. Quite simply, this is where the details about your travel and flights will be. Departing and arriving flights, and onwards travel when you get to the USA. This is a simple section where you can buy your travel insurance. There are links to the specific website and instructions on what insurance to buy. This is your payment section where all of the payments you make towards camp will be. Making a payment is extremely easy and it will prompt you when you need to make one. To get hired by a camp, you need 3 references from previous employers, teachers etc. I got mine from 2 employers and my old head teacher just by emailing them the request form. There will be lots of documents that you will need to sign and scan on, and this is where they all go! In here will be your medical form, police check and camp contract to name a few. Once all of the above has been completed, you are off to camp!!!! If you have any questions that I haven't covered above, just leave a comment and I will get back to you.